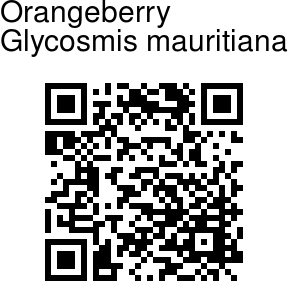 Orangeberry is a large shrub to small tree up to 4 m tall, bearing small, translucent pink fruits with juicy flesh and a sort of spicy, gin-like flavor. Bark brown, smooth. Leaves are compound, pinnate (rarely 1-foliolate), alternate, spiral. Leaflets are 3-5, alternate, 9-16.5 x 3.5-5 cm, oblong or elliptic, apex shortly tapering with blunt tip. Base is pointed, margin toothed. Flowers are born in velvety panicles in leaf axils. Flowers are small, white, stalkless. Berry is round, pinkish, up to 2 cm across, with 2-3 seeds. 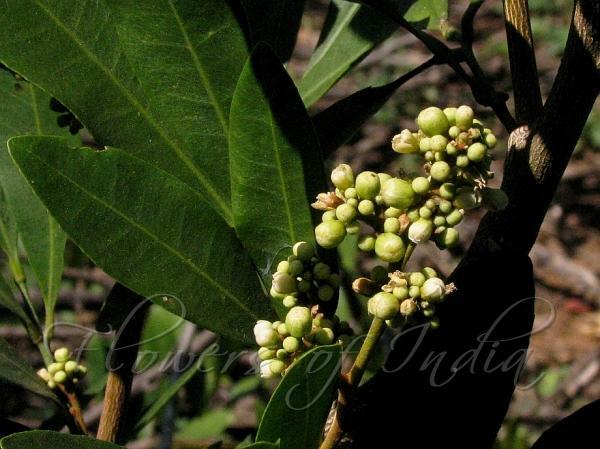 Orangeberry is found throughout the Western Ghats.